There are few ancient authors as compelling as Lucretius: scientist, poet, philosopher, passionate observer of nature. While Caesar, Cicero, and Vergil have long vied for first place in the classical curriculum, Lucretius' treatment of universal human matters rightfully earns him a place in their company. Catto's annotated text of Lucretius' De rerum natura provides 53 unadapted Latin passages in 1,294 lines (with macrons marked), spanning all 6 books of the epic. Passages included are (semi-colons indicate a new section): (Book 1) 1-43; 50-61; 62-101; 102-116, 146-48; 149-73; 215-29, 232-36; 250-64; 265-84, 295-97; 298-321; 329-45; 358-69, 400-09; 419-28, 430-32, 485-88, 498-502, 528-30; 565-76; 921-50; 958-59, 963-83; 1021-37. (Book 2) 1-33; 37-42, 44-61; 95-99, 114-22, 142-52, 157-59, 161-64; 216-24, 251-68, 289-93; 308-10, 312-32; 333-35, 338-70; 523-27, 532-40; 646-60; 991-1009, 1013-19, 1021-22; 1023-47; 1052-65, 1074-76; 1090-1104; 1150-52, 1157-74. (Book 3) 1-30; 37-64; 94-97, 136-44, 152-60; 323-49, 830-42; 894-903, 912-30; 931-65; 978-1023. (Book 4) 1058-64, 1089-110l 1120-22, 1129-40, 1144-59, 1177-79; 1278-1287. (Book 5) 1-2, 6-27, 37-51; 64-77; 195-234; 235-46; 432-48; 925-34, 937-47, 953-61, 966-72; 1011-23; 1028-29, 1041-45, 1050-51, 1056-61; 1161-68, 1183-89, 1194-1203; 1392-1404, 1412-35; 1448-1457. (Book 6) 58-78; 1090-97, 1138-44, 1256-58, 1267-86. This is a good book. Those who wish to give second and third-year college students of Latin a good sampling of the De rerum natura, would do well to give this text their consideration. Following in the tradition of other learning texts offered by Bolchazy-Carducci, Catto’s book offers the student not only a full sampling of the poem, but also an abundance of notes, vocabulary, and, perhaps most noteworthy of all, a florilegium of relevant passages selected from ‘classical’ and non-classical authors that bear upon the particular Luretian passages to which they are attached. It is this combination of features which makes the book worthy of serious examination by anyone who intends to introduce students to Lucretius and his important poem. Those who teach Lucretius to undergraduates — as I have — may find themselves wishing — as I did — for a volume of excerpts that provides the student with linguistic and intellectual aids for translating and comprehending this difficult but magnificent Roman poet without the spoon feeding that vitiates so many heavily annotated school texts. They need look no further than this book, a thoughtful edition of key selections from the poet prepared by Bonnie Catto. Bonnie Catto’s seventeen-page introduction is... a treasure trove for the teacher. The passages are so chosen that the student has a comprehensive sampler of both Lucretian ‘purple passages’ as well as the more technical passages of philosophical and scientific exegesis. I wish that it had been available when I taught Lucretius, and I wish more ancient authors were so splendidly served. 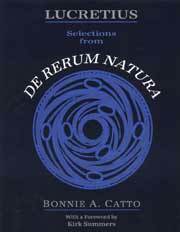 Bonnie Catto's Lucretius: Selections from De Rerum Natura is a welcome achievement for those of us who introduce this exciting text to high-school students... I have found other editions to be either too abridged, or too advanced in their expectations of the students' ability with Latin; all are too sketch in their presentation of modern scientific theory. Catto, however, provides enough notes so that fourth-year students can work out the passage on their own and also enough passages so that they get a good overall idea of the structure of Lucretius' poem. The variety of compared passages (from Empedocles to Stephen Hawking) renders most of my homemade handouts obsolete. Finally, Catto's questions...invite opinions on Lucretius' thoughts and methods of explanation and illustration. She has made an already relevant poem accessible to younger and intermediate students.